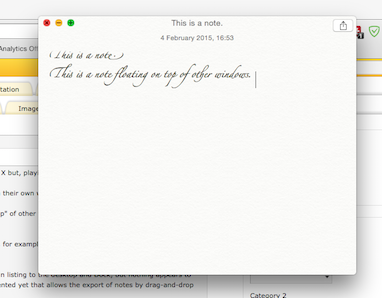 The Notes app has become a standard feature of OS X but, playing with it today, I spotted an interesting feature. First of all, notes within the list can be opened within their own window. Just double-click them. You can then close the main list window. Secondly, these new windows can be made to “stay on top” of other windows using the Window > Float on Top menu option. This is ideal if you’re making notes from a web page, for example, and don’t want to keep having to click the Notes icon in the Dock to make the window reappear. Don’t forget that you can highlight and drag text between windows too – a standard OS X feature – and which can really speed-up note-making. I also noticed that you can drag notes within the main listing to the desktop and Dock, but nothing appears to happen. I assume this is a feature not quite implemented yet that allows the export of notes by drag-and-drop (you can already click File > Export as PDF).